Created by one of the top providers, Eyecon, Legend of the Five Ninjas Slot is a series of ‘Five Ninjas’. Played on 5 magnificent reels with 243 Ways to Win, this game will take you to another dimension with the five ninjas, Ka, Sui, Ku, Chi and Fu. Join the warriors anytime and anywhere convenient to you on your tablets, mobiles and desktop devices. Simply log on to your Vegas Spins account and launch this sensation game relish more fun and action throughout your gaming journey. Ready to begin your fun gameplay with the Ninjas on Legend of the Five Ninjas Slot. Simply log on to your Vegas Spins account and launch the game. The symbols you will see rolling on the reel along with the Five Ninjas namely Ka, Sui, Ku, Chi and Fu are: Scroll, Sword, Bombs and many more weapons. Plunge into this adventure and watch the reels spin in an enigmatic forest. Bet Levels: No Bet levels are offered on Legend of the Five Ninjas Slot. Amount of Paylines Selection: Legend of the Five Ninjas Slot is packed with 243 ways to win. It helps to form more winning potentials. 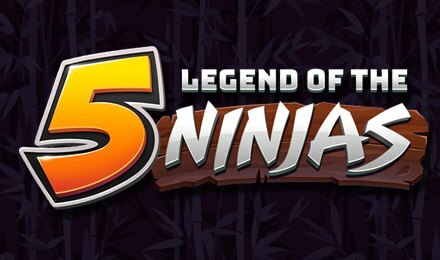 Coin Values: The minimum stake value on Legend of the Five Ninjas Slot is 0.25 up while the maximum is 50.00 per spin. Select you preferred stake values and also, if you want to place the highest stake, click on the max bet button. The Scroll Symbol represents the wild symbol on Legend of the Five Ninjas Slot. It substitutes all the symbols on the reels apart the Scatter symbol to complete a winning combination. The Scroll Symbol lands only on reels 2, 3 and 4. Also known as the Godai, the colourful Ninja with pearls acts as the scatter symbol. You could be awarded with 5, 10 or 50 respectively for landing 3, 4 or 5 Godai symbols on the reels. 5 free spins with a 10x to the wins. 8 free spins with a 5x to the wins. 10 free spins with a 4x to the wins. 15 free spins with a 3x to the wins. This splendid feature can also be activated during the free games awarding you with more winning possibilities. Good Luck for your session with the magnificent Ninjas on Legend of the Five Ninjas Slot.